Sandy and the Three owner, Anne Butler, at Three circa 1972. Image courtesy of Sandy Rapp. 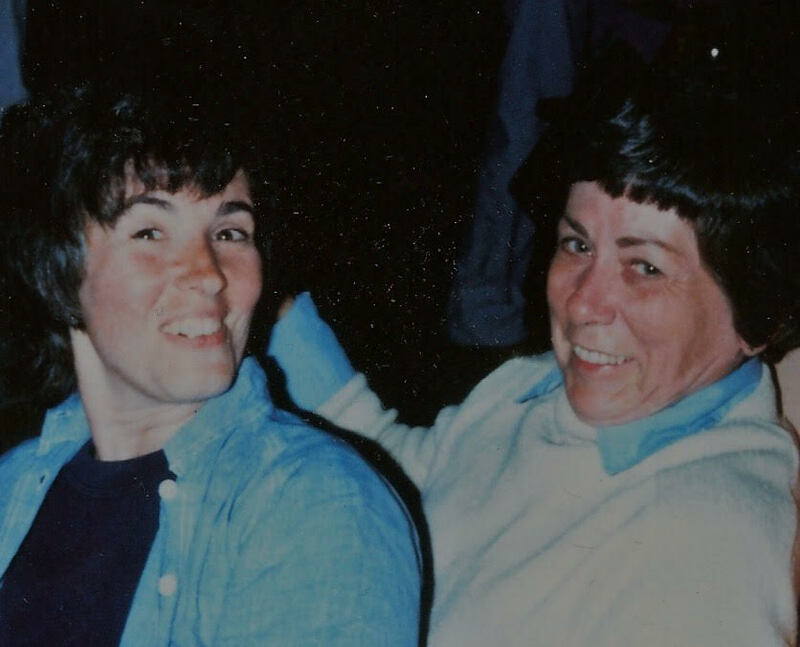 Gwen Shockey: What was the first experience you ever had at a predominantly lesbian or queer dominated space and what did it feel like to be there Sandy? Sandy Rapp: I was in New York from London (I’m a musician, so I had been playing in London). I’m American but had been attending school in Scotland and then playing in London. I had some business in Ohio, where I’m from, and then came to New York and immediately got a job in a straight bar singing, which is how I made my living. In London I worked at a piano bar and in New York I was playing guitar in Upper East Side bars until I got into gay bars where I also played music for a living. It was 1968 and I heard there was a lesbian bar called Kooky’s in the Village and I went down there and felt very comfortable. However, everyone was butch or femme and the dynamics were very stereotypical and stylized, very stylized. I ran into this gorgeous woman named Patsy Hemmingway and she said, “Oh, we’ve got to get you uptown. You can’t be down here.” Kooky’s was kind of a rough room and I thought that was what she meant. So, up we went, Pat, and couple of her friends, I think it was her girlfriend Rita, a recent arrival from Cologne, Germany and Wendy Fabulous (so-called for her frequent use of the term), a wealthy Park Avenue type, and I, first to Three, then to Hemmingway’s bar, the Bull’s Head Tavern at 293 3rd Ave. Somewhere we were joined by Alison Gold, a young divorcee who would one day leave the bar scene to make a very fine name for herself as author of two best-selling Anne Frank-related books. I called her about this interview and she remarked: “We were having our youthful walks on the wild side…” So, that was my first gay bar experience. GS: Wow! Ok! So the Bull’s Head was a lesbian bar? SR: Mhmm! Well, many of the bars were mixed, and by mixed I mean even a few straight people. But the Bull’s Head was mostly women and it was woman-owned. So It was a woman’s bar. SR: No, but some of them were. Some of these people are still alive and I won’t get into which ones were and which ones weren’t but some were and some weren’t. Anyway, I’ll carry on talking about the bars. I, as I said, was singing at the straight bars. I was singing at a place called Toby’s. I was strolling around and I found myself singing to these people at a table at which sat someone whose name was Pat Smith. She said: “You’ve got to come to my bar!” She was another Pat with another gay bar! (Laughing) Pat Smith had a woman’s bar in The Volney Hotel on the East Side and I mean it was JUST crazy! She acted like the people in the Volney didn’t know it was a lesbian bar and nobody ever said anything! She put a man and a woman at the front table and they’d have to sit there so when you’d look in the door from the lobby you’d see a man and a woman. It was mostly women, but gay men would come too and straights. These bars were sort of mixed. Well, Pat said, “You have to work here!” So, I got a second job there singing at Chez Pat after I finished at Toby’s. I was working two jobs a night. Pat’s would start at eleven o’clock or something like that. There was another singer there, a piano player, called Jeannie Burns and she and I would trade sets at Chez Pat. When the lights dimmed it meant a suspicious stranger had arrived. I had to stop singing and just play. There was the State Liquor Authority phenomenon, selectively enforced on gay bars, that without a cabaret license there could be no singing. So, that could be used as an excuse to close the bar. I sang it at the Millennium March on Washington; and I sing it every year at Gay Veterans’ Association Reunion at the Center in Manhattan. Other groups, like the Women’s Movement had academia; Civil Rights had the church; but we didn’t have any place and we weren’t comfortable in our own families. So that’s why our culture became so bar-centric. It was very difficult to be anywhere else. In the late 1960s and ‘70s we’d come into these bars like the ones I was telling you about, including Chez Pat. And that bar, as did many, had a counterpart in the Hamptons. Pat moved the words around by cut/splicing the awning to put the “Pat” before the “Chez” for PatChez of East Hampton. I sang at that one too. In related news, before she appeared in the Manhattan bar scene, Pat had been a web girl with Ringling Brothers Circus and had also ridden Dumbo the elephant. Then there was Pat Hemmingway’s Bull’s Head. She also had a Bull’s Head in Bridgehampton, New York. Other gay bars at that time included a restaurant called Finn and Claw, which was woman-owned. And there was Gwen Saunders, who ran a lot of bars including Pub Society, the Hot Line, which featured inter-table telephones (laughing), and the Beaded Bag, which was a gay men’s bar. There was also the Blow Up on East 49th Street and the Hampton Wick on the East Side. Gwen’s Hamptons presence was Out of this World in Wainscott. Then there was Kooky’s, which I mentioned, and Uncle Charlie’s then a men’s bar, still there at 139 East 45th St., and one in the Village called the Ramrod. And there was the Stonewall, at 53 Christopher Street, bless it’s heart. My favorite place was Three. Three was the epitome of a theater bar. It was mixed and a restaurant (reviewed very favorably by Florence Fabricant) and really quite something. I went with the owner for many years. She is now on the other side. Her name was Anne Butler and her partner in the restaurant was Jackie Scott. There was a third partner who was a guy but they bought him out. It was a place where many celebrities were comfortable, gay or not, just because people would sort of leave them alone. The food was good and, just before my time, Judy Garland would stop in to sing a song once in a while. I’m not implying that she was gay, she wasn’t, but she would feel comfortable stopping in to sing a song. I was the house band there for a while and I would open for better-known acts and drop-in guest performers. And the playwright Sidney Michaels would write in there. Sidney was a friend of mine and is best known for Dylan. We wrote a show together. The owners of Three then bought a second club called Mary, Mary, which was another sort of theater club which opened during a cab strike and then burned down almost immediately. It took a toll on the owners who then closed Three. Those two owners and I (Anne was my partner) all moved out to the Hamptons to work at the Grotto of the Purple Grape, which was owned by my good friend Vida Pernick. This also was a really great room, good food, good music, good fun. I’ve got a miniature of the sign that hung over the Three. It’s a stained-glass sign that hung over the door. I’ll send you a picture of it. I’m trying to find a way to light it from the back. I’ve still got the chairs from the Three at my dining table. Image courtesy of Sandy Rapp. GS: Do you recall the locations of a lot of these bars, particularly the lesbian-centric spaces? SR: Well, Three was at 314 East 72nd Street. I lived there with Anne and they had a net lease on the building. The Volney Hotel is where Chez Pat was. GS: Do you remember where the Grapevine was? SR: The Grapevine… oh boy. I don’t remember. I think it was East Side. SR: I was in an alcohol recovery program by the time I was twenty-four. I drank from when I was fourteen to twenty-four but then stayed in the bars just with soda. I have two beverages beside me right now: water and coffee! (Laughing) I’ve been sober for forty-seven years! GS: What was it like to come out at that time? SR: Oh, it was very problematic. Especially because I was trying to stay sober in these bars and everyone was so uptight. It was really very difficult. The people in the straight bars wouldn’t know you were going to a gay bar afterwards and they’d want to follow you and it was just very, very complicated. Eventually I fled the city. I went out to the Hamptons and became an activist. I had the house band at a place in Sag Harbor called Baron’s Cove. I was there for almost a decade and everyone knew I was gay and it was no problem. When I became very visible in the media, doing a couple of gay bills in East Hampton Town and then in Suffolk County, it became sort of a problem. GS: Did you feel it was dangerous for you to be out when you were younger? SR: I didn’t feel vulnerable. I was very young in the City and I didn’t feel it was physically dangerous. But it was psychologically very confusing to try to be yourself but to not be yourself; and you didn’t want to implicate your friends because they’d lose their jobs. It was a very complicated life in those days. You must be very young! SR: You’re a child. I’m seventy-two. GS: A huge motivator in doing this project was the lack of out lesbian representation I experienced as a child. I couldn’t put a name to the feelings I was having until late in high school simply because I hadn’t heard the word lesbian in a positive sense and didn’t know there was a history or community for me. You are offering such a generous gift of insight into the past for me and for generations of queer women and people to come. I would love to hear more about your music and how music played a part in your coming out and your experiences in the bars. SR: I’m a jukebox. I can play a lot of things. I played at restaurants and was the house band for bars and I played so many different things. I can play World War I songs, big band song, Janis Joplin songs, Ricky Nelson, all sorts of songs! I’m working on an album right now. It’s just going to be streaming, no hard media. It’s ninety-percent my own topical songs about feminist history, gay history, stories about women in the movement and so I’m sort of involved in that right now. I only wrote one song at Three and that’s Mary, Mary. If I send you an MP3 can you play it? Have you ever heard of Camp Sister Spirit in Mississippi? I think, vis a vis gay-positive attitudes, Mississippi was behind even the Midwest. There were just no places or enclaves for women, so they started a women’s musical festival there, Brenda and Wanda Henson. They were a couple that took the same name. Brenda is dead now but they ran this festival and I think it’s still running. Andie, Brenda’s daughter, runs it now. It was a women’s music festival down in the belly of the beast! I think I played three times down there. You just can’t get there from here! (Laughing) You fly to Washington and then you fly to Birmingham and then someone drives you out into the middle of nowhere. It’s like going to Antarctica. I called it Sister Camp in my song and I think they use that name also. 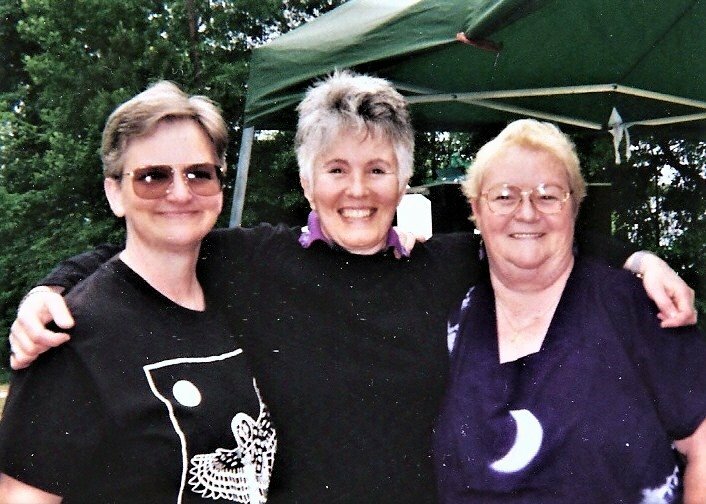 Wanda and Brenda Henson (left to right) and Sandy in the middle at Camp Sister Spirit. Image courtesy of Sandy Rapp. GS: How did you first start playing music? SR: I started when I was four. I seemed to have a good ear for the piano and I come from a family in which one side was opera and the other side was a singing group. These were one generation up, not my parents. The family on my mother’s side ran an opera company in Cleveland and I just seemed to have rather a musical bent. So, I studied piano for a long time and it was quite obvious to me that I wasn’t going to become a concert pianist, although it was thought by some that maybe that would be a good idea. It wasn’t. At first I had to keep my guitar in the garage. It wasn’t really considered an instrument. Once I got a nicer guitar I got it inside and I just started playing for money and school. I needed spending money and I’ve always worked as a musician which is nice. I did a lot of gay activism and wrote a book called God’s Country: A Case Against Theocracy. It was about the Reagan/Bush Administrations and what was happening with gay rights, women’s rights, abortion and privacy and that sort of thing. That’s still out there. It was not a best seller but it’s still out there. GS: That’s great! I’ll have to look it up. So, you grew up in Ohio and then how old were you when you moved to New York? SR: I was in Ohio for the first couple years of college and then I transferred to the University of Aberdeen in Scotland and got an MA there. I came to New York in 1968. GS: So much was happening in New York at that time with Civil Rights, the Feminist Movement and of course the Stonewall riots taking place that year – were you politically active when you were that young? SR: No. I wasn’t. I was singing in the gay bars and I was working with Sidney Michaels on a play about Shakespeare, which we eventually put on at the New Dramatists’ Theater with John Cullum in the lead. But I was not an activist yet. I had been born to Republicans and in 1979, when I realized that Reagan had gone against the ERA and against reproductive rights, I woke up and started paying attention to politics. Then I became very active. I got a gay civil rights bill through in East Hampton, did one in Long Island’s Suffolk County, and became increasingly less employable in the Hamptons. So I started working more with the festivals and doing my own material at conferences and rallies and things like that. GS: Were you traveling around quite a bit? SR: I traveled, yes, and did a little touring. Never full-time but yes, I’d venture out. Are you based in the city? GS: Yes, I live in Brooklyn. SR: You’ll have to come to the Stonewall Veteran’s thing this year. I play there every year. It’s going to be in the Lutheran’s Church on June 22nd. I’ll be singing Everyone was at Stonewall and I’ll do something else, I’ll do a couple of songs. I always do, every year. GS: Oh, that’s so great! Can you tell me a little bit about writing the song Everyone was at Stonewall? SR: Rich Amato, a mid-Long Island activist and I were doing a lot of work with legislation in Suffolk County. He and I worked together. We were also teaching the police cadets. They have a three-month long class or something like that and we’d go do Gay Sensitivity Training on what was a whole sensitivity day for them. I realized that some of them had no idea why the gay community might feel hostile towards them. At that time the truth was that bars were our center of gravity and the police were the agents of institutionalized homophobia. They would selectively enforce electric codes, saying, “You have to close your bar, you have a Christmas tree that’s plugged into an extension cord.” They would raid the bars and the most spectacularly dressed would be put into paddy-wagons. In the old days one wasn’t legally permitted to wear more than three articles of clothing belonging to the other gender… I mean, there was a reason for the Stonewall rebellion. It wasn’t a riot. It was a rebellion. It’s interesting what happened with Stonewall. I was at Chez Pat when Stonewall happened. We were closing the place up and George, the Chez Pat maître d’, had been off, and came back around midnight and said, “They raided the Stonewall!” And we said, “What else is new? (They often raided the Stonewall). He smiled: “No! This time they fought back!” That was kind of the turning point and my first knowledge about what took place there that day. We didn’t realize then how important it was, but I remember the night and I remember what he said about it. So, it meant something that they were fighting back, you know? GS: Did you ever experience a bar raid Sandy? SR: No. Those East Side bars didn’t get raided much… harassed but not raided. Lights would blink when an unknown person was arriving and you weren’t supposed to dance with who you were dancing with; and there were all sorts of codes and things that went on. But, no. I was never in a raid. GS: I’m curious why you distinguished that Stonewall was a rebellion and not a riot? SR: It was a rebellion. Well, I’m friends with Willson Henderson, President of the Stonewall Veteran’s Association, who was actually there when it happened. He makes it a point to distinguish that it really wasn’t a riot. Nobody got killed, nothing got burned down – it was a rebellion. Here, I have a clip here of some remarks he made on the subject. It went on for several nights but it was a demonstration. I heard about it but I wasn’t there. Pat and I went to Connecticut after we heard about it, so were not in town for the next two nights. My song is called Everyone was at Stonewall because for many, many years after Stonewall, even people who would have been in utero in 1969 were still saying, “I was there!” I really wasn’t there. I was in another gay bar during Stonewall. Everyone wants to have been at Stonewall. GS: Well I give you credit for admitting that you weren’t there! (Laughing) I’m curious what you might hope younger generations learn from your song since you’re singing it at the 50th anniversary? SR: Eternal vigilance! Look what’s going on in our country right now. We have got to stay on top of things, be registered to vote, and be aware of these issues. As gays we have to be aware of privacy rights and of reproductive rights. The government shouldn’t be permitted to mess around with your body or your bedroom. It’s a scary thing. Many people take privacy rights for granted and soon they’ll not have even birth control access… I mean, it’s really going downhill very fast. GS: Yeah. I feel as though the 50th anniversary of Stonewall couldn’t come at a more auspicious time, considering the political moment we are in right now. I think we all need a reminder to be vigilant and to be active and to be aware of our history. SR: We all need to stay alert and be reminded of our history. You’re doing it! GS: Thanks. Looking back at this history it struck me how few lesbian voices have come through so that is really a motivator for me with this project. As a visual artist I feel art played such an important role in our history with AIDS activism and in protest. I’m curious how you see music playing a role in the activism surrounding the rebellion? SR: In the sixties music was really doing something in the Civil Rights Movement and in the Anti-War Movement and the Women’s Movement later. I stick to my guns and sing my songs. I’ve played a lot of NOW [National Organization for Women] rallies. I have a song called Remember Rose: Song for Choice, and on the recording Bella Abzug, the late, great feminist congresswoman from New York, sings a guest vocal. I’ve sung this song at many, many rallies and demonstrations. My partner, Marilyn Fitterman, was president of NOW New York State. So we did a bunch of rallies together. I think music has a huge role in activism, and I keep on at it though it remains quite obscure. Left to Right: In 1992 Congresswoman Bella Abzug (D-NY) joined former NOW-NYS President Marilyn Fitterman and Sandy Rapp in Rapp's "Remember Rose: Song for Choice.” Image courtesy of Sandy Rapp. GS: I feel that with my own work since it is so oriented around lesbian history. Lesbians and queer women seem to enjoy it and some others but yeah, I understand what you mean! SR: I did want to take you through the rest of this list I made of gay bars that existed in the Hamptons before I forget. When the owners closed Three, we all came out to the Hamptons and worked at a place owned by a woman named Vida Pernick, with whom I just talked to a few minutes ago. Vida’s place was the Grotto of the Purple Grape in Bridgehampton. It was a two-level club. The top of the club was a restaurant and bar and the bottom of the club was called the Grotto and it looked like a cave. She sort of coated it with Styrofoam and there were purple lights and I don’t know what else created that atmosphere. My partner, Anne Butler, worked in the upstairs bar, Jackie worked in the downstairs bar and I sang downstairs. Upstairs was a fellow named Freddie Hamilton, singing at a piano, and then we’d get together and do a show together every once in a while. Vida’s partner, Enrica, was an Italian woman and a fabulous chef who cooked there. Later, in the city, where Three had been, there arose a bar called Peaches Three at the same location. It didn’t last for very long. There was a women’s bar in the Village called the Duchess (around 7th and Sheridan) and another called Bonnie and Clyde’s. I think that migrated to Long Island’s North Shore as Bonnie’s by the Sea. Then there were other Hampton’s bars out there called the Millstone, the Attic, and the Swamp. The Swamp was mostly a male club and they didn’t want to let women in. My friends Lilia Milani and Syd Beiner sued them for excluding women. Swamp closed, eventually, before the suit was settled. But that’s what happened. The thing about women’s bars was that... I’m sure you’ve heard of the fifty-nine-cent dollar. So women made fifty-cents to every dollar made by a man. If you have two women, you’ve got half the disposable income. So, for bars that’s not so good; and women don’t drink as much anyway usually. It was very hard for women’s bars to stay in business. That was one reason why the Swamp was trying to keep women out. They didn’t drink as much. Women’s income made it very difficult to support the women’s bars. That’s all I have written down so now you can just ask anything else you want! GS: This might sound like an odd question but I would love if you could sort of paint me a picture of what the Three looked like. SR: Let’s see. Before I was working there I would come in as a customer carrying my guitar from another club. I’d come in around twelve o’clock. I was a heavy drinker and I was still drinking when I was going there as a customer but stopped shortly after. The front was sort of like a townhouse and was rose-colored. There were three or four steps down to get to it and when you got to the door there was a stained-glass sign hanging overhead that said “Three”. It was lit from behind. So, you’d go in and there was a very long bar. The aisle was on your right and the bar was on your left and Anne Butler would be behind the bar. She was five-foot-two and would be on double duck boards. She was not very smiley but she was very witty and was sometimes called the Silent Butler. She could do the New York Times Sunday crossword in nanoseconds, in ink. You’d come up to the bar and order something and maybe buy a drink for your friend; and there were beer mugs there, I always drank beer. There beside me at the bar is Mary Jane (we called her MJ), she was always there. You’d go in a little further and there’s a sit-down area with a fireplace and maybe Jackie would be sitting there. It was a nice, welcoming place. There were tables with people talking, mostly women but some men too and maybe Sidney is over in the corner writing a play that might get onto Broadway. But he certainly was not gay nor was he cruising or doing anything but writing plays and chatting. There are people ordering dinner and there is the backroom, through a little hall, with restrooms on the left. On the right would be an open window and florescent lights shining through with the chef, cooking, sweating and finishing up by now since it’s around twelve o’clock. The backroom was another very nice room. There’s a spinet at the very far end and people sitting around tables, maybe someone playing the piano. Eventually I would work there, sitting on a stool beside the piano, singing and playing guitar. Or if someone was singing I’d play the piano for them in this sort of the entertainment area. That’s what it looked like! Can you see it? SR: The barstools and chairs were all dark wood with black vinyl upholstery. GS: Was it pretty butch/femme at the Three? SR: It was much less stylized there. People were more relaxed about that. It wasn’t so stereotyped. GS: Did you identify as butch or femme or did you feel that wasn’t really you? SR: I guess I’m kind of butch but I’m not very imitative but I’ve always been very, very uncomfortable in a dress. After I stopped having to wear them to school I never bought one again. GS: Finally, did you want to mention anything else about the new album you’re working on? I froze it there in 2014 as Everyone was at Stonewall (final update). So, a lot of the songs were updated when Supreme Court decisions or other events happened. These will be the final updates to these songs. Studio time here in Florida is about half the price as in the Hamptons or in God-forbid New York. I’ll be glad to send you a link to the collection when it’s done. It will, of course, be on iTunes; and through SandyRapp.com. GS: Well, Sandy I don’t want to keep you for ages this evening but thank you immensely for talking to me about your history and music. The "SVA's 50th Annual Conference and Stonewall Veterans' Reunion is Saturday, June 22, 2019, at the landmark St. John's Evangelical Lutheran Church, 81 Christopher Street off 7th Ave. in Greenwich Village, Manhattan, New York from 3:15 to 6 PM. All are welcome.